Bert Ogden Edinburg Mazda brings Edinburg-area drivers the perfect compact SUV to take on any adventure. The 2019 Mazda CX-5 comes equipped with a tech-focused interior paired with a sleek and sporty exterior. The CX-5 is ready to tackle any road trip or adventure you throw its way with its suite of advanced safety features and the latest in-car technologies. The 2019 CX-5 is available in five athletic trim grades – Sport, Touring, Grand Touring, Grand Touring Reserve, and Signature – for a starting price of $24,350. Drivers can put their own personal style into the CX-5 with its seven available exterior color options - Soul Red Crystal Metallic, Snowflake White Pearl Mica, Machine Gray Metallic, Sonic Silver Metallic, Jet Black Mica, Deep Crystal Blue Mica, and Eternal Blue Mica. Are you curious to see just how well the CX-5 stands up against the competition? 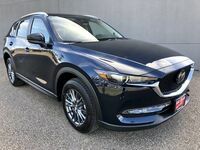 Continue reading this 2019 Mazda CX-5 vs 2019 Nissan Rogue® comparison to find out. What are the differences between the 2019 Mazda CX-5 and 2019 Nissan Rogue®? The 2019 CX-5 offers a reliable EPA-estimated fuel economy of 25/31 (city/highway) mpg paired with its 15.3-gallon fuel tank. With the SKYACTIV®-G 2.5-liter DOHC 16-valve 4-cylinder engine and a SKYACTIV®-Drive 6-speed automatic transmission with manual-shift and Sport mode under its hood, the CX-5 generates a heart-pounding 187 horsepower. The competing 2019 Nissan Rogue® is powered by a 2.5-liter DOHC 16-valve 4-cylinder engine paired with a Continuous Variable Transmission to generate 170 horsepower. Inside the 2019 CX-5 drivers stay connected throughout every drive with the available Apple CarPlay™ and Android Auto™. Simple voice commands allow drivers to easily access their favorite smartphone apps without ever letting go of the steering wheel. Drivers can opt for the available Bose® 10-speaker audio system that will fill the 2019 CX-5 with crystal-clear tunes. The 7-inch full-color touch screen display with MAZDA CONNECT® makes staying connected in the CX-5 a breeze. The competing 2019 Nissan Rogue® features a NISSANCONNECT® 7-inch touch screen display to help drivers stay connected behind the wheel.